Any content marketer can attest: The demand for great ideas is rising. 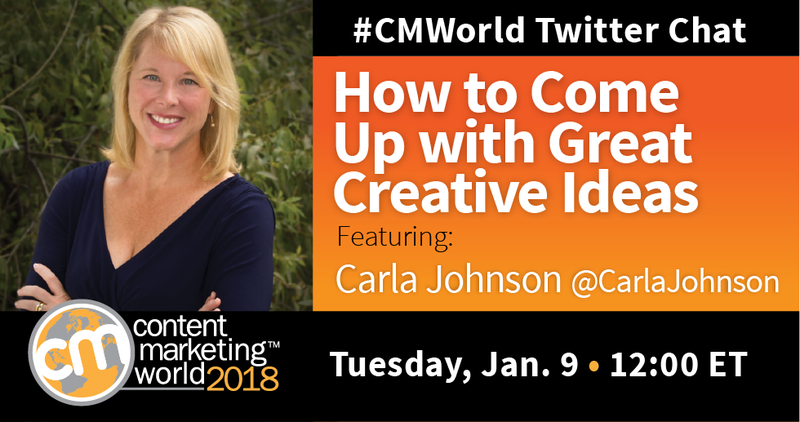 But as #CMWorld Twitter chat guest Carla Johnson explains, hearing “no” too many times beats down our creativity. In fact, Carla’s latest CMI blog post explains how not to get discouraged. So how can we marketers pitch a creative idea? How much detail should we invest? Our community had mixed responses. What exactly are we pitching? Our #CMWorld family have a wide variety of ideas they’d like to see come to fruition this year. What’s one big idea you’d like to see come to life in 2018? Let us know in the comments below. Here’s to dreaming big! Spur your creativity by learning from industry pros at Content Marketing world 2018. Register this month to secure Super Early Bird pricing!